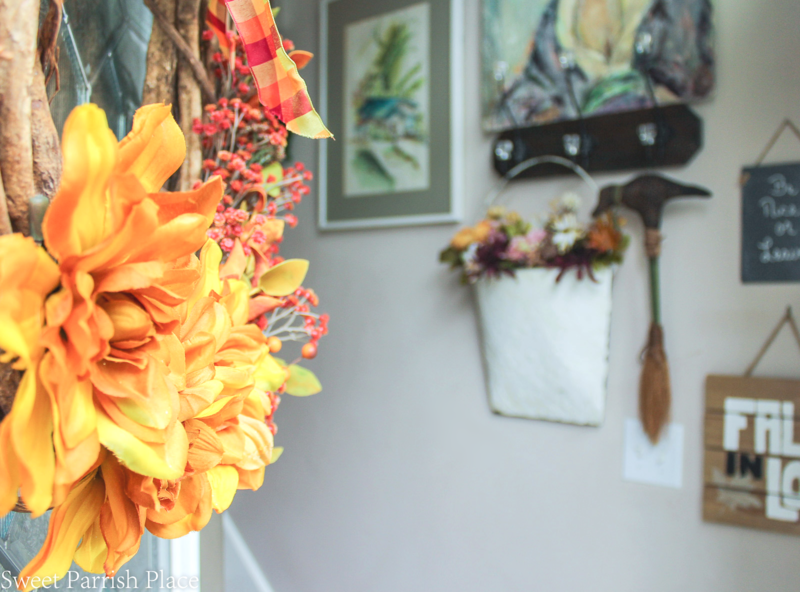 Welcome to the first part of my colorful fall home tour, today I am sharing my entryway all dressed up for fall! Hey friends! I hope you made it through this week. I’m not gonna lie, I’m barely hanging on. But things are looking up because it’s Friyay! 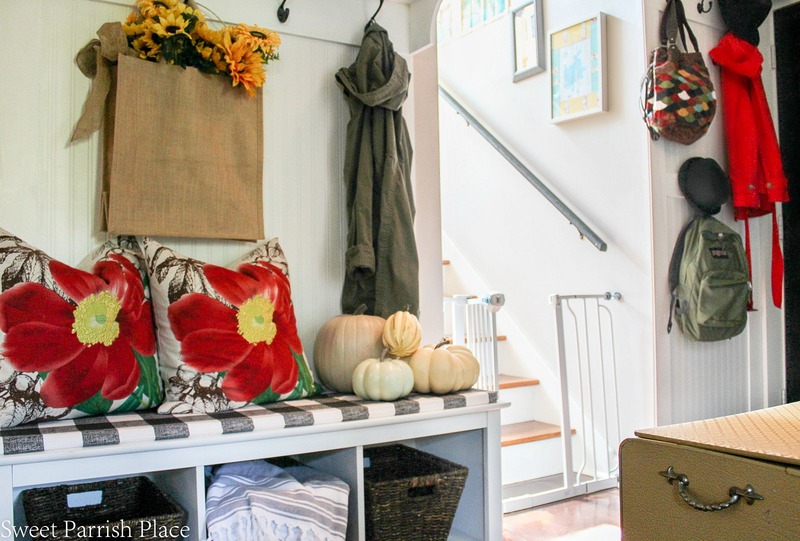 Today kicks off the first part of my colorful fall home tour, and I am so excited to share my entryway all dressed up in it’s fall wardrobe. 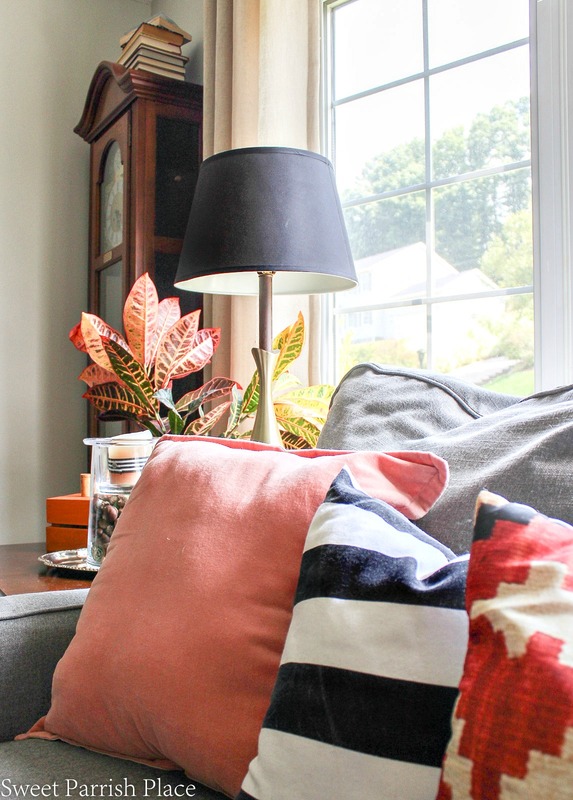 Although fall is not my favorite season of the year, I do enjoy many things about the season, and two of my favorite things about it is how cozy the house feels when it’s all decorated for fall, and getting to start adding cozy layers to my wardrobe. I live in West Virginia, and I have to say it is such a beautiful state when the weather turns to fall, and we have such beautiful mountains that have gorgeous color in the fall. If you are ever looking to take a little trip to see the leaves changing, WV is a wonderful destination. Before we get started let me catch you up to date. We live in a split level home that was built in 1996. We moved in in 2012, and have been slowly updating this home as our budget has allowed. 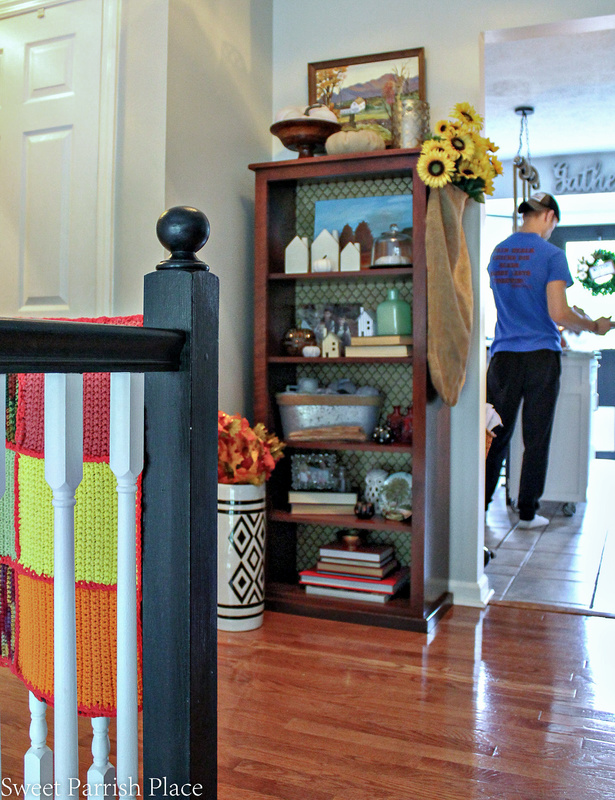 The entryway is basically a platform and you can either go upstairs or downstairs. I did the best I could to make this a functional space for our family. But I have to say it is not ideal, and it is definitely not my favorite set up. 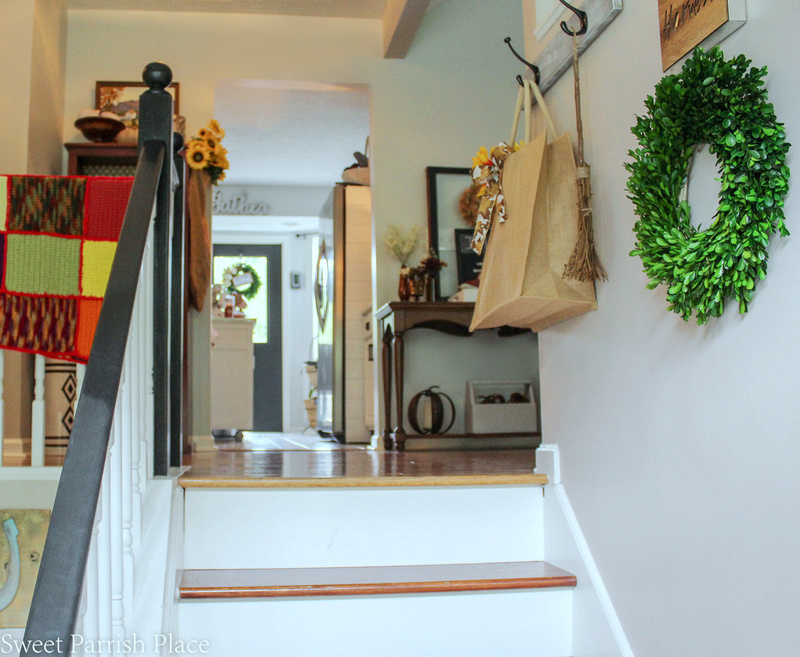 This is not our forever home, and I know that one day I will have an entryway that is not a split level like this. So for now, we make it work. 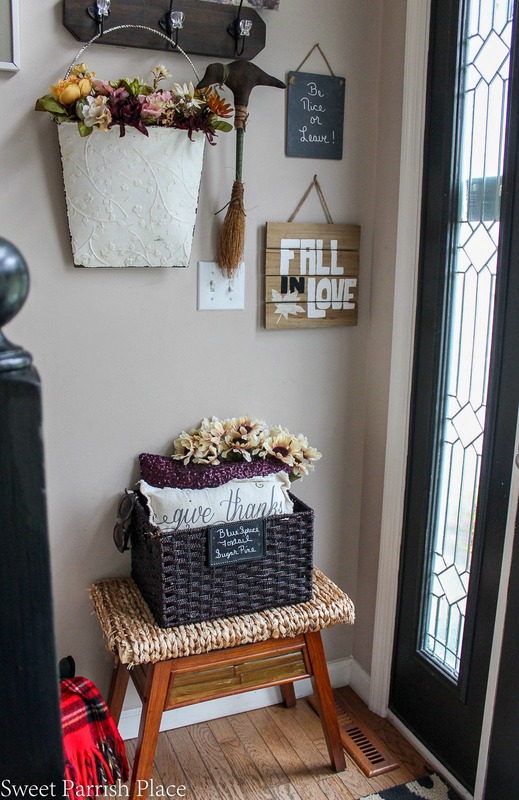 I hope you enjoy this little tour of my fall entryway today! 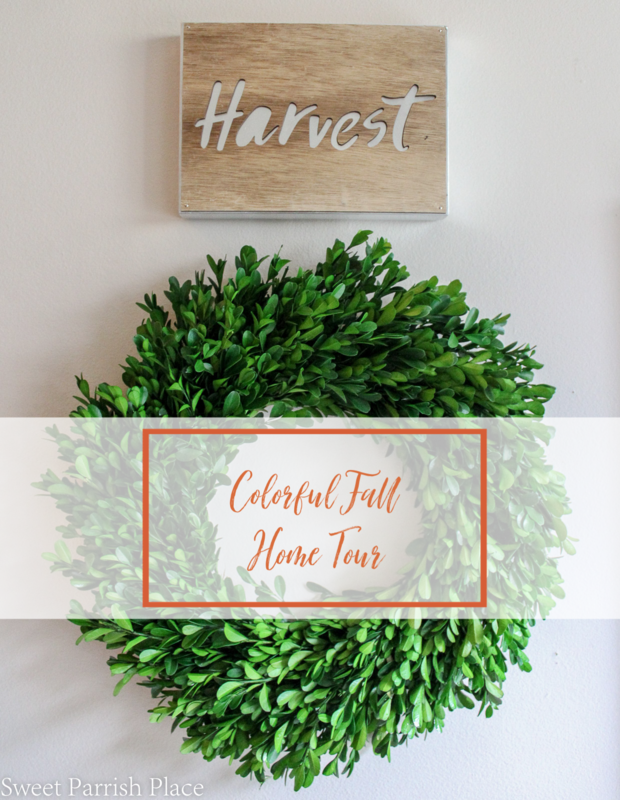 I hope to be back next week to share more of my colorful fall home tour with you. In case you haven’t guessed, I am a color loving girl! 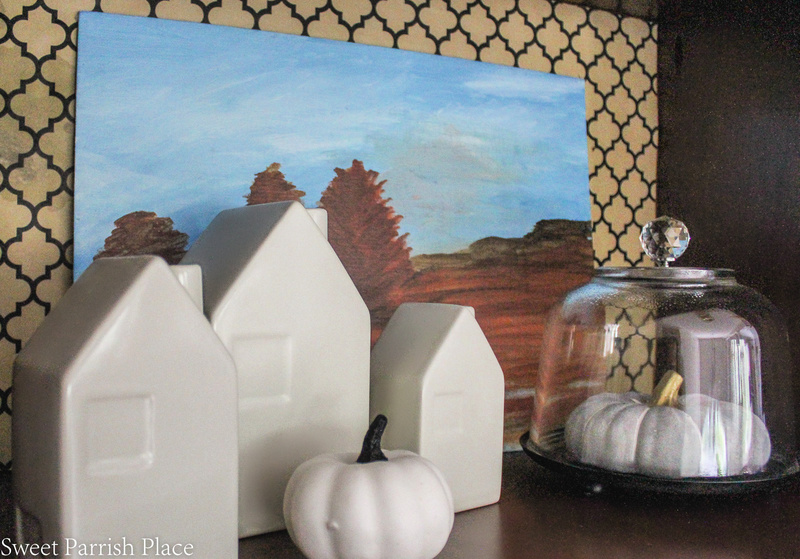 This year, I did paint a bunch of my faux pumpkins using a couple of different shades of grey and some blush ( I just wasn’t feeling the orange pumpkins right now), and then I have also mixed in some rust, some gold, some plum, some soft greens, and some other pops of color into my home. I also tried to keep things a little more simple. I am a clutter loving girl as well, but I have found myself wanting to simplify a little bit lately. 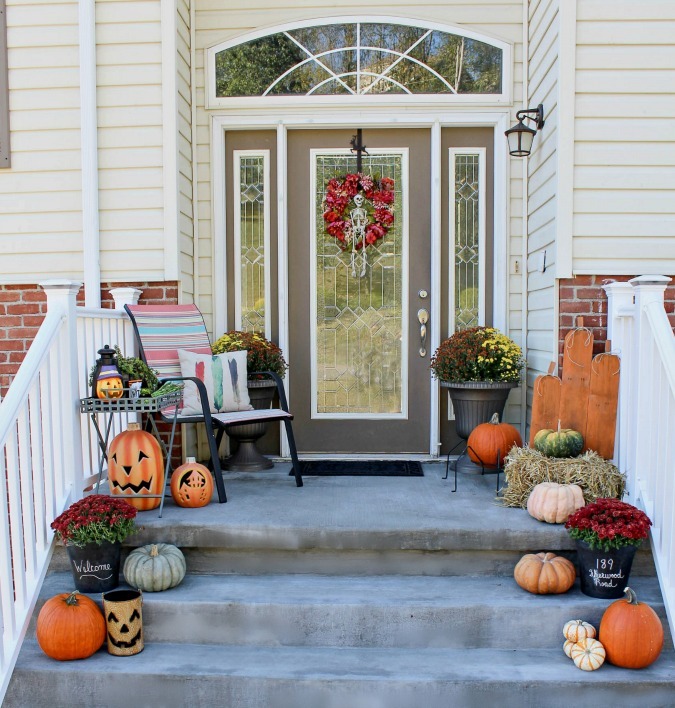 So I tried to do that in my Fall decor this year. This little bench is something I purchased when we moved into this home, and it fits perfectly in this small little space, but I think it’s time to start searching for something new to put here, because our dog, Tyson Chicken Nugget, has chewed this one a little too much. The little stinker. I actually think he is through the stage of chewing on furniture, but I have been waiting to be sure to replace this piece. All of the doggie things are hidden away in this basket and the antique crock that sits next to it. Things like leashes, doggie bags, disposable feeding bowls, you know, the usual things dog owners keep next to the door. My daughter made me the little wooden sign that says fall in love a couple of years ago for my birthday, and I cherish it. I think it’s really cute, and now that she has moved away to Miami, it is a nice reminder of her. 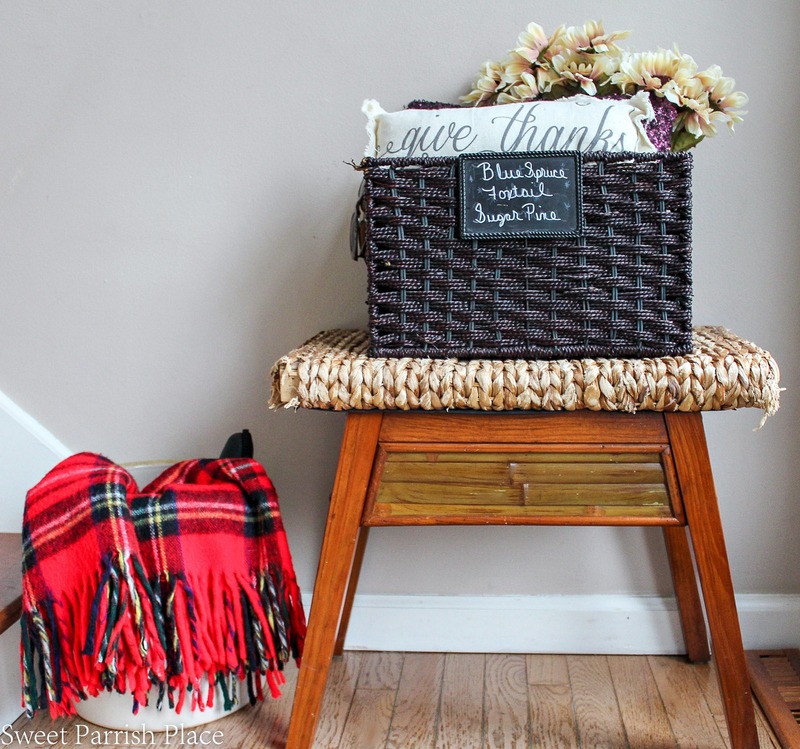 The red plaid throw that you see in the crock hiding all of the uglies was a thrift store find. There was a blue plaid one that I bought along with this one. They are Pendleton and I was super happy to find them. 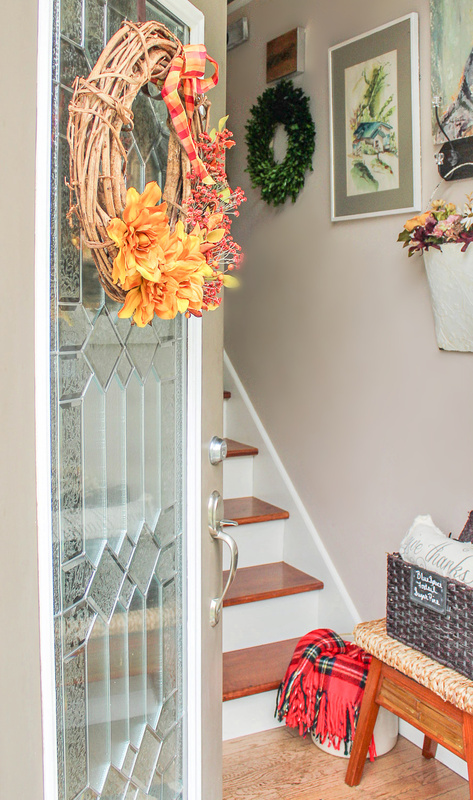 I literally threw this wreath on my front door together in less than 10 minutes using a grapevine wreath I already had, and some flowers and other odds and ends that were in my floral supplies. the flowers are little clip-ons that I bought at Walmart last year and never got around to using. You will be seeing this wreath up front and personal when I share my little front stoop, which is coming soon. If you have been a follower for any amount of time, you have seen this Ikea shoe cabinet in my entryway before. Believe me when I say that it is a life saver. The two bottom drawers hold a plethora of shoes that used to be just randomly flung all over this very tight entry. This cabinet fits perfectly in this space, and I do not know what I would do without it. Not a lot usually changes as far as decor in this spot. My little succulent does great here, so I don’t want to move it. I’ve had the large jar forever, and I just plopped in some cotton stems. Then I added some wooden beads I found recently at Hobby Lobby and kind of wrapped them around the jar. I love the tassels on the end of these beads. 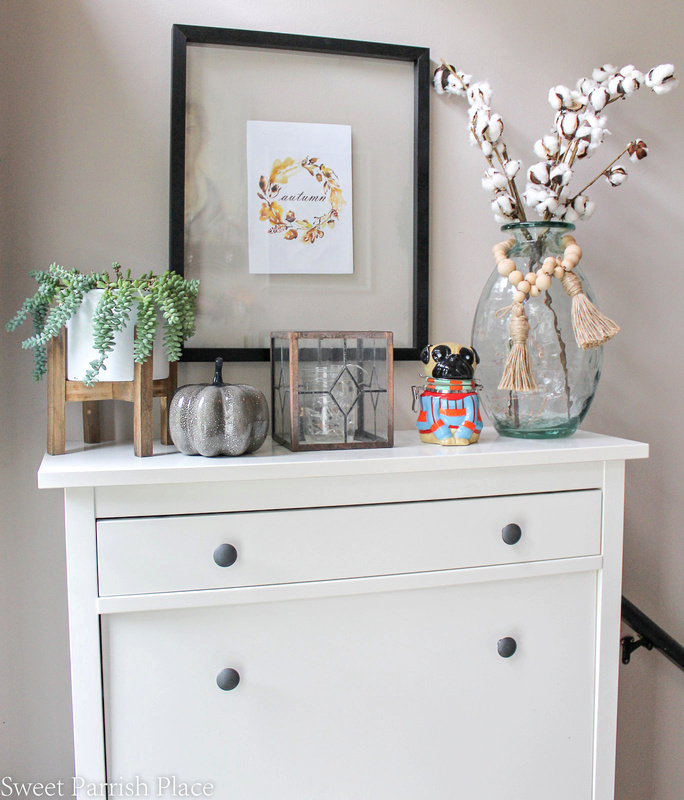 I love to use the large frame for seasonal artwork, and this is a free printable that I found and printed out myself. 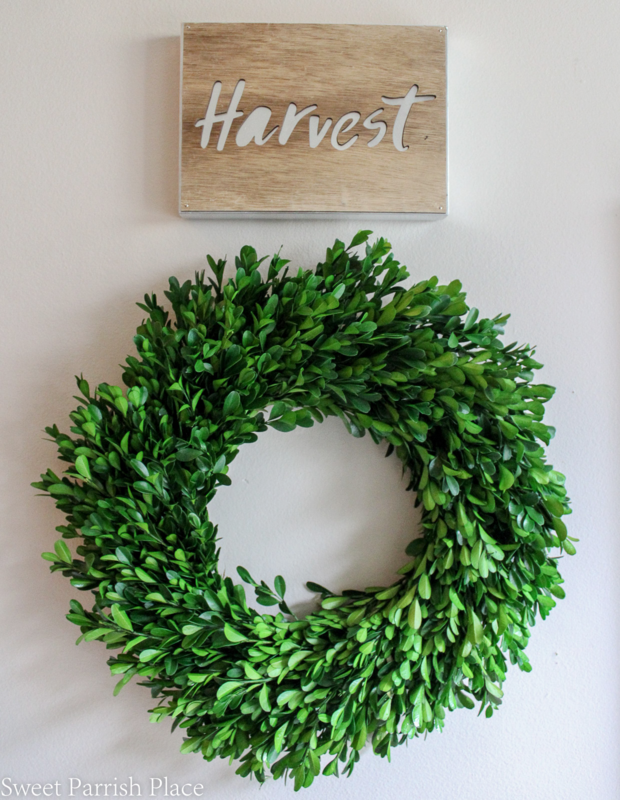 This preserved boxwood wreath is new, and I can see it sticking around for many seasons. I absolutely love it so much! I got it from Silk Plants Direct, and it came in a set of two for what I thought was a really fair price. I think it is just so pretty that it doesn’t really need much. 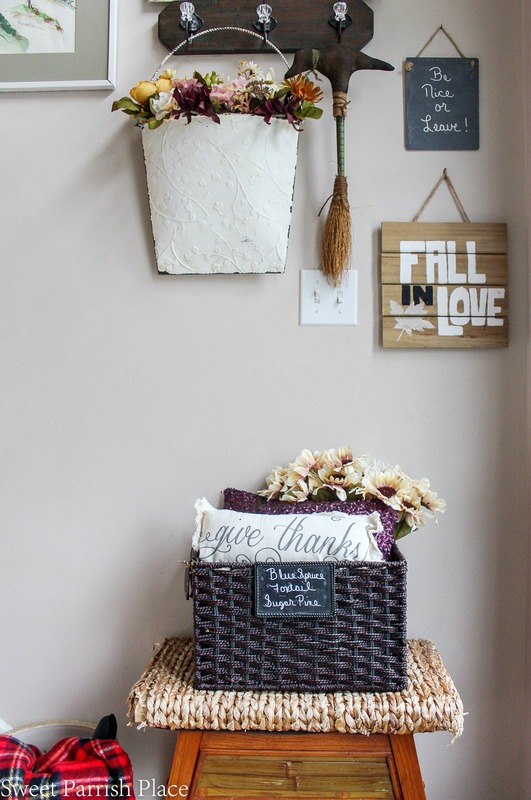 so I left it as is, and added this cute harvest sign that I bought last fall from Target. As you head up the stairs, you will catch a glimpse of our kitchen, which is currently undergoing a pretty big update. I have shared a lot of our progress in my Instagram stories, and it is all saved under two tabs named kitchen 1 and kitchen 2 if you would like to watch. 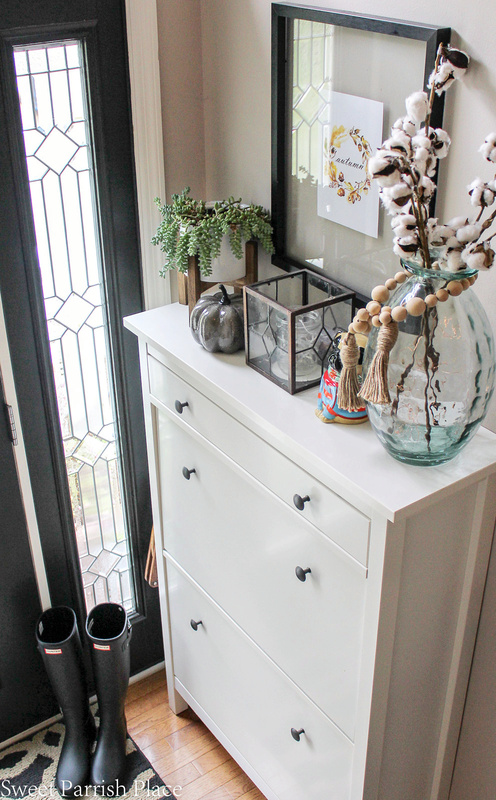 But I haven’t share much on the blog because I will be joining the One Room Challenge in just a few weeks and the Kitchen will be the focus. I will be sharing this kitchen makeover once per week for 6 weeks, and that begins on October 4th. so stay tuned for that if you want to see my miraculous kitchen transformation. I found the colorful afghan that is hanging on our banister at a thrift store and I just think the colors are so perfect for fall and winter. I thought I would share a glimpse at the bookshelf right at the top of the stairs. This is always the most awkward thing to photograph, and I go back and forth as to whether I should paint this. It was handmade in Sugar Creek Ohio by Amish people, which is the only thing that has kept me from taking that plunge. But I no longer am a fan of this color of wood like I used to be, and I have several pieces of furniture that are similar in color. unfortunately, we can’t afford to just replace all of our furniture. I did add some cute wrapping paper to the backs of the shelves, and am probably going to update it to something different soon. Maybe that will satisfy my desire to lighten up this bookshelf. 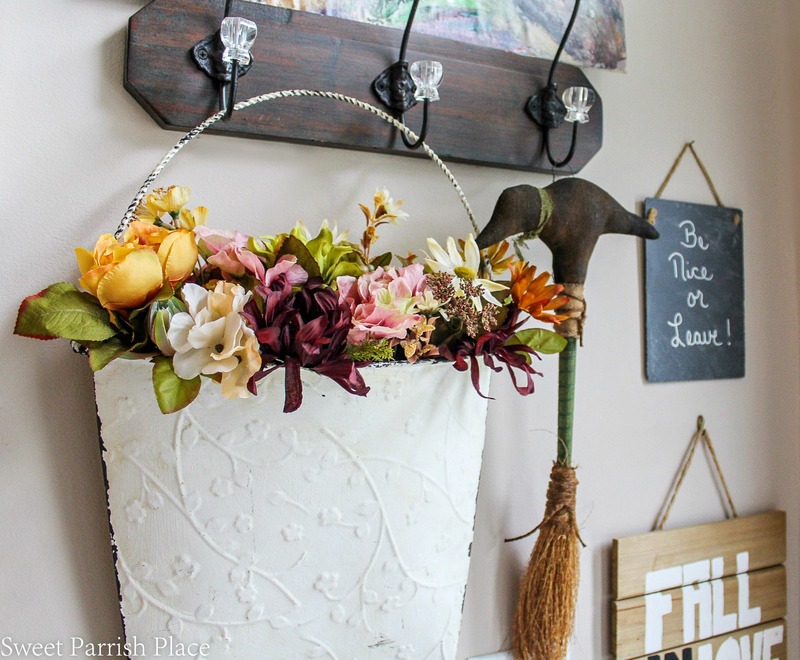 I tacked this burlap sack up on the side of this shelf, and I like adding seasonal things to this. 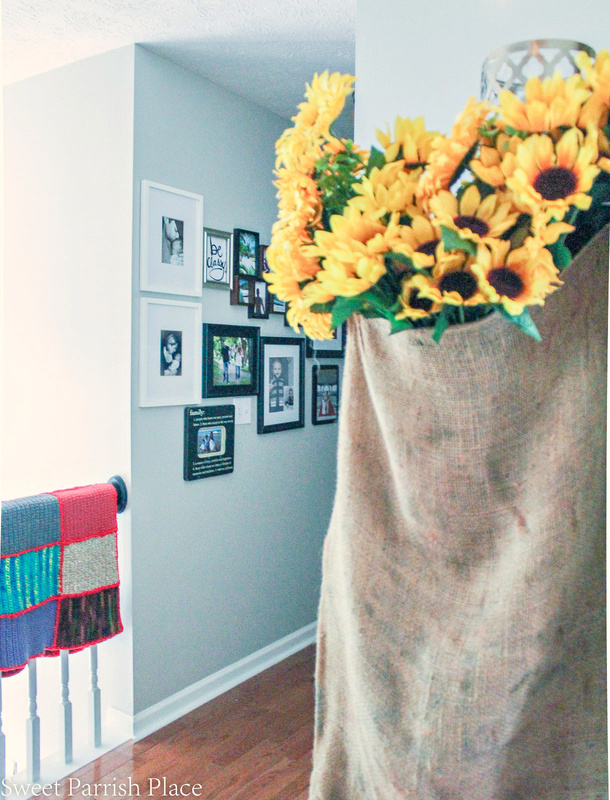 this year, it’s sunflowers for fall. And you can see a little peek down the hallway that leads to three of our bedrooms. This gallery wall of photos is another thing that is due for a little update around here. I found this painting in a local thrift store. I think it is perfect for fall. If you look closely, you can see that the artist signed it. If you are a local person reading this, and you think you might know who painted this, please let me know! 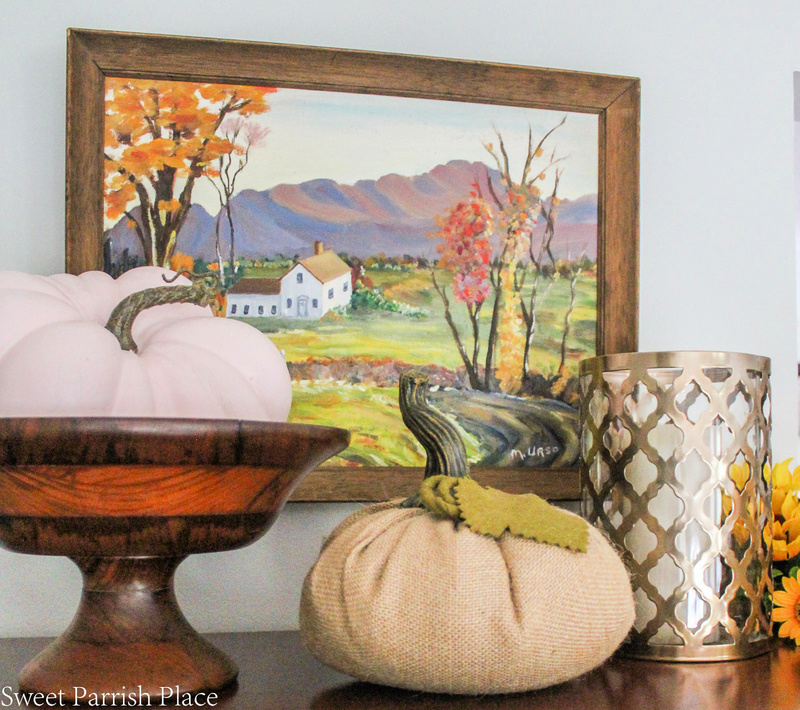 On the shelf below is another thrifted painting I found that gives me all the fall vibes. The little creamy colored house are from the Hearth and Hand line at Target. I love moving them around and adding them to different vignettes. Enjoy your weekend friends! I’m hoping to have more of my Fall home to share one day next week! Very nice. Wouldn’t it be funny if the sign said “Be Nice or Leaf” with a little drawn on leaf. Especially funny as we rake 32 bags of leaves on our lawn. Happy Autumn! Yes, that would be a really cute idea! Poor you raking leaves for days! Have a good weekend, maybe jump in a big pile of leaves, that’s always fun! You have incorporated such pretty fall colors! We are “states neighbors.” I live in KY but my antiques booth in Huntington. I am a MU grad as well. Go herd! Enjoy the beautiful WV fall colors!